XpertDate™ is the tool you use to input or edit a date, date and time or a date range through a graphical interface. XpertDate™ is used throughout XpertMart™: to enter a date and time to the Dated Prices Catalog; to enter dates in documents such as Purchase Orders and Receipts; to schedule processes such as Price Updates and the Synchronization of data between the Main and the Remote stations; and to select date ranges when running reports. XpertDate™ provides a faster and easier way to enter dates and has the added advantage of allowing you to enter dynamic dates. Depending on the type of date field you are viewing, the XpertDate™ window that appears can either be the basic XpertDate™ tool, the XpertDateRange™ tool for dynamic dates, or the XpertDateTime™ tool to enter dates and times. The XpertDate™ window automatically opens whenever you press the small button with a downward arrow that appears to the right of a date field. The basic XpertDate™ window has three components: across the top there are drop-down menus for months and for years; in the middle the days of the selected month are displayed in calendar format; and, at the bottom, the current is displayed. In the example below, the user is looking at the month of November, 2001. The current date is Novembeber 30, 2001. In addition to being displayed at the bottom, the cell corresponding to the current date (November 30 in the example above) always appear highlighted in white. To select a date, simply move the cursor to the desired date and click the mouse. If you wish to select the current date (Today's Date) then simply click on the white bar along the bottom. The XpertDate™ window will automatically close and the date you have chosen will appear in the date field. (Note that you cannot close the XpertDate™ window by pressing the X in the upper right-hand corner; you must select a date for the window to close). If you want to change the date you selected, reopen the XpertDate™ window (by clicking on the small button to the right of the date field). The cell corresponding to the date you had previously selected will appear highlighted in red. In the example shown above, the user had previously selected November 1. To pick a different date, simply click on the new date of your choice. the XpertDate™ window will close and the new date will appear in the date field. To select a different month than the one being displayed, click on the small downard arrow appearing to the right of the month to open the Month drop-down menu (shown below). 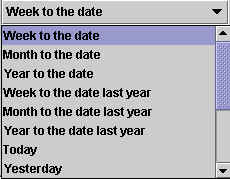 The drop-down menu contains the twelve months of the year. When you pick a different month, the XpertDate™ window will automatically refresh to show the corresponding days of that month. Once again you can click on any date to enter it. An additional way to select a month is to use the Previous button and the Next button to scroll through the months. In the example above, Pressing the Next button will display the month of December and pressing the Previous button will display the month of October. You can continue pressing these buttons, even scrolling through new years, for example, pressing the Next button when you are viewing December 2001 will take you to January 2002. To the right of the Month field is the Year field which is also a drop-down menu which you can open by clicking on the button to the right of the year. The drop-down menu displays seven years at a time: three years before the current year (1998 - 2000 in the example below) and three years after the current year (2002 - 2004). As with the Month menu, you can also use the Previous and Next buttons to scroll through the years. When you select a new year, the XpertDate™ window will refresh to display the corresponding days of the month and year you have selected. You can also type a year directly into the Year field, as shown below. This can be useful because for some processes, XpertMart™ uses December 31, 1969 as a default date and it can be time consuming to scroll through more than 30 years. Many times, especially when running reports, XpertMart™ will ask you to enter a date range. 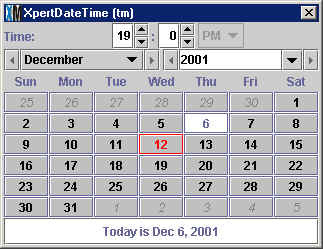 In these cases, a window will open asking you to select a date range, as shown below. When you press the browse button to the right, the XpertDateRange™ window (shown below) will open. The date range you select can be static (with a defined Start and End date) or dynamic (with a relative Start and End date). If you want a static date range, then select a Start date and an End Date in the the two fields at the top of the XpertDate™ window. If you click on the browse button to the right of either the Start date field of the End date field the XpertDate™ window will open and you can make your selection as discussed above. When you have selected the Start and End date, click <OK> and the XpertDateRange™ window will close and the dates you have selected will appear in the date field. If, on the other hand, you prefer to select a dynamic date range, then click on the Dynamic checkbox and the Dynamic Range drop-down menu will become active. A dynamic date range takes the current date (Today's Date) as a point of reference and therefore can vary depending on the day it is being run. The dynamic range drop-down menu includes 14 options to choose from which are explained below. Week to the date: The range is from the beginning of the current week to the current date. The first day of the week can be defined using the drop down menu at the bottom of the XpertDateRange™ window. If today's date is November 30th and the begining of the current week is Sunday, November 25th, then the date range in this case would be November 25 - 30. This option is useful, for example, to get a preview of how the week's sales are doing before the week has ended. Month to the date: The range is from the beginning of the current month to the current date. If today's date is November 30th, then the date range would be November 1 - 30. This option is useful, for example, to get a preview of how the month's sales are doing before the month has ended. Year to the date: The range is from the beginning of the current year to the current date. If today's date is November 30th, 2001 then the date range would be January 1 - November 30, 2001. This option is useful, for example, to get a preview of how the year's sales are doing before the month has ended. Week to the date last year: The range is from the beginning of the week last year to the current date the year before. If today's date is November 30th, 2001, then the date range would be November 26 - 30, 2000 (assuming Sunday has been selected as the First day of the week). Note that the range begins with November 26th and not 25th since in the year 2000 the week began on Sunday, November 26th. This option is useful to set a benchmark of how sales performed during the week the year before to then compare with how they are doing during the same period this year. Month to the date last year: The range is from the beginning of the month last year to the current date the year before. If today's date is November 30th, 2001, then the date range would be November 1 - 30, 2000. This option is useful to set a benchmark of how sales performed during the same month the year before to then compare with how they are doing during the same period this year. Year to the date last year: The range is from the beginning of the year last year to the current date the year before. If today's date is November 30th, 2001, then the date range would be January 1 - 30, 2000. This option is useful to set a benchmark of how sales performed during the year before to then compare with how they are doing during so far during the current year. 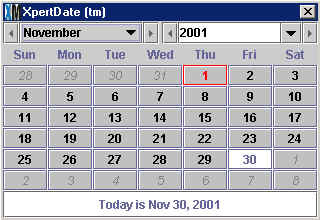 Today: This option would define range as only the current date (November 30, 2001 in the example above). Yesterday: This option would define range as the day before the current date (November 29, 2001 in the example above). Last 'N' Days: Takes 'N' days ago to the current date as the date range. The 'N' value is the parameter entered in the Numeric Range field. For example, if you enter 10 as the N value, and today's date is November 30, 2001, then the range would be November 21 - 30, 2001. Last 'N' Weeks: Takes 'N' weeks ago to the beginning of the current week as the date range. The 'N' value is the parameter entered in the Numeric Range field. For example, if you enter 10 as the N value, and today's date is November 30, 2001, then the range would be September 16 - November 25, 2001. Note that this date range only includes complete weeks. Since in this example the current date is Friday, November 30th, the last complete week was November 19th - 25th (assuming you've selected Sunday as the First day of the week). In this case, the range would run 10 weeks back from this week (inclusive). Last 'N' Months: Takes 'N' months ago to the beginning of the current month as the date range. The 'N' value is the parameter entered in the Numeric Range field. For example, if you enter 10 as the N value, and today's date is November 30, 2001, then the range would be January 1 - October 31, 2001. Note that this date range only includes complete months. Since in this example the current date is Friday, November 30th, the last complete month was October 1 - 31st. In this case, the range would run 10 months back from this month (inclusive). 'N' days 'X' days ago: Takes a period 'N' days long, starting 'X' days ago. The 'N' and 'X' values are the parameters entered in the Numeric Range field. If the 'N' value is 10 and the 'X' value is 20, then the range would be November 10 - 19, 2001 (assuming the current date is November 30, 2001). The range is exactly 10 days long (the 'N' value) and begins 20 days (the 'X' value) before the current date . If the 'N' value is 10 and the 'X' value is 5, then the range would be November 25 - December 4, 2001. This date range is useful for analyzing a period of days that do not neatly fit into a standard week or set of weeks. 'N' weeks 'X' weeks ago: Takes a period 'N' days long, starting 'X' weeks ago. The 'N' and 'X' values are the parameters entered in the Numeric Range field. If the 'N' value is 10 and the 'X' value is 20, then the range would be July 8 - September 15, 2001 (assuming the current date is November 30, 2001). The range is exactly 10 weeks long (the 'N' value) and begins 20 weeks (the 'X' value) before the current date . If the 'N' value is 10 and the 'X' value is 5, then the range would be October 21 - December 29, 2001. This date range is useful for analyzing a period of weeks that do not neatly fit into a standard month or set of months. 'N' months 'X' months ago: Takes a period 'N' days long, starting 'X' weeks ago. The 'N' and 'X' values are the parameters entered in the Numeric Range field. If the 'N' value is 5 and the 'X' value is 10, then the range would be February 1 - June 30, 2001 (assuming the current date is November 30, 2001). The range is exactly 5 months long (the 'N' value) and begins 10 months (the 'X' value) before the current date . If the 'N' value is 10 and the 'X' value is 5, then the range would be June 1, 2001 - March 31, 2002. This date range is useful for analyzing a period of months that do not neatly fit into a standard year or set of years. Use these fields to define the parameters used to calculate certain dynamic date ranges. The 'N' value refers to the length of the date range and the 'X' value specifies how far back the range begins. 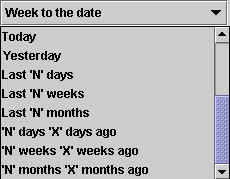 The 'N' and 'X' values are expressed in days, weeks or months, depending on the date range being calculated. To change the parameters, enter the desired values in the 'N' and 'X' fields. When you press <Enter>, XpertMart™ will calculate the new Start and End dates and display them in the Date Range box at the top of the XpertDateRange™ window. You can continue entering 'N' and 'X' values to fine-tune the date range; just be sure to press <Enter> every time so that the Start and End dates are refreshed. 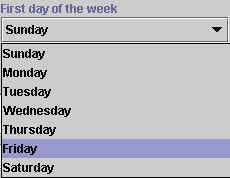 Use this drop-down menu to define which day of the week you want to use as the First day of the week. 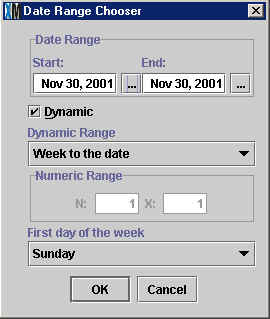 The day you choose will be used when computing the Week to the date and Week to the date last year dynamic date ranges. Typically users will want to pick Sunday or Monday as the start of the week though in some cultures Saturday is the first day of the week. You use the XpertDateTime™ tool when you need to schedule a task in the future such as a change in prices or the synchronization of date. When you press the browse button to the right of a Date & Time field, the XpertDateTime™ window will launch. XpertDateTime™ window (shown below) is very similar to the XpertDate™ window; the only difference is that there are fields at the top where you can enter an hour and minute. If you enter an hour value less than 12 then the drop-down menu on the right will activate and you need to specify if it is AM or PM. If the value is more than 12, then the system will assume you are using the 24-hour system and will automatically calculate the PM equivalent (for example if you enter "19" then the system will assume you mean 7 PM). When you enter a minute value great than 60, the system will automatically calculate the equivalent in hours and minutes. If, for example, you have "19" in the hour field and enter "65" in the minute field, when you press enter XpertMart™ will display "20" in the hour field and "5" in the minute field.